UTAH BEACH was added to the initial invasion plan almost as an afterthought. The allies needed a major port as soon as possible, and UTAH BEACH would put VII (U.S.) Corps within 60 kilometers of Cherbourg at the outset. The major obstacles in this sector were not so much the beach defenses, but the flooded and rough terrain that blocked the way north. OMAHA BEACH linked the U.S. and British beaches. It was a critical link between the Contentin peninsula and the flat plain in front of Caen. Omaha was also the most restricted and heavily defended beach, and for this reason at least one veteran U.S. Division (lst) was tasked to land there. The terrain was difficult. Omaha beach was unlike any of the other assault beaches in Normandy. Its crescent curve and unusual assortment of bluffs, cliffs and draws were immediately recognizable from the sea. 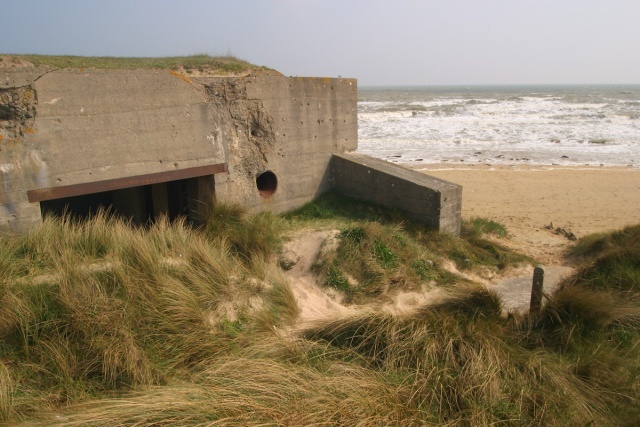 It was the most defensible beach chosen for D-Day; in fact, many planners did not believe it a likely place for a major landing. The high ground commanded all approaches to the beach from the sea and tidal flats. Moreover, any advance made by U.S. troops from the beach would be limited to narrow passages between the bluffs. Advances directly up the steep bluffs were difficult in the extreme. 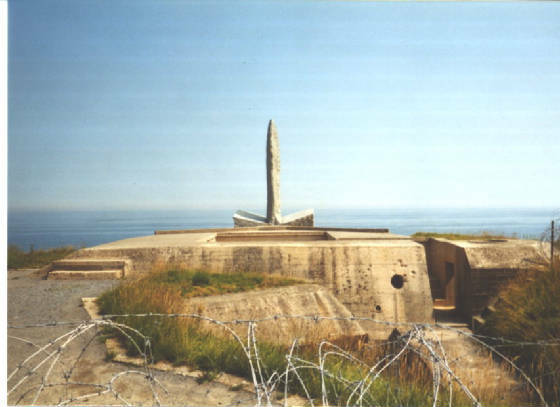 German strong points were arranged to command all the approaches and pillboxes were sited in the draws to fire east and west, thereby enfilading troops while remaining concealed from bombarding warships. 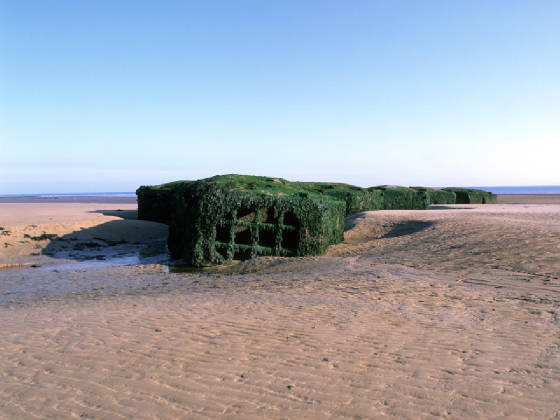 These pillboxes had to be taken out by direct assault. Compounding this problem was the allied intelligence failure to identify a nearly full-strength infantry division, the 352nd, directly behind the beach. It was believed to be no further forward than St. Lo and Caumont, 20 miles inland. V (U.S.) Corps was assigned to this sector. The objective was to obtain a lodgment area between Port-en-Bessin and the Vire River and ultimately push forward to St. Lo and Caumont in order to cut German communications (St. Lo was a major road junction). Allocated to the task were 1st and 29th (U.S.) Divisions, supported by the 5th Ranger Battalion and 5th Engineer Special Brigade. 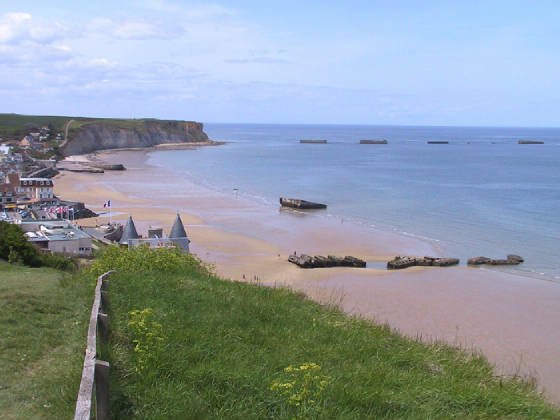 GOLD BEACH was the objective of the 50th (Northumbrian) Division of the British 2nd Army. Its primary task was to seize Arrolnanches (future site of a Mulberry) and drive inland to seize the road junction at Bayeux, as well as contact U.S. forces on their right and Canadians on their left. The initial opposition was fierce, but the British invasion forces broke through with relatively light casualties and were able to reach their objectives in this sector. A major factor in their success was that the British assault forces were lavishly equipped with armour and "Funnies" of the 79th Armoured Division. The "Funnies" were the specialist vehicles, armed with 290 mm mortars, designed for tasks such as clearing obstacles or minefields and destruction of large fixed fortifications. Perhaps the most famous is the "Flail" tank, which was a Sherman equipped with a large roller to which was attached lengths of chain. These tanks were designed to clear terrain to their front, and detonate mine fields and other booby traps without danger to the tanks or infantry following. JUNO BEACH was the landing area for 3rd Canadian Division. The Canadians were very concerned about their role in the invasion (as were most of the planning staff) as the memory of 2nd Canadian Division's destruction at Dieppe was still fresh. But many lessons had been learned, and the 3rd Canadian Division, in spite of heavy opposition at Courselles-sur-Mer, broke through and advanced nearly to their objective, the airfield at Carpiquet, west of Caen. The Canadians made the deepest penetration of any land forces on June 6th, again with moderate casualties. 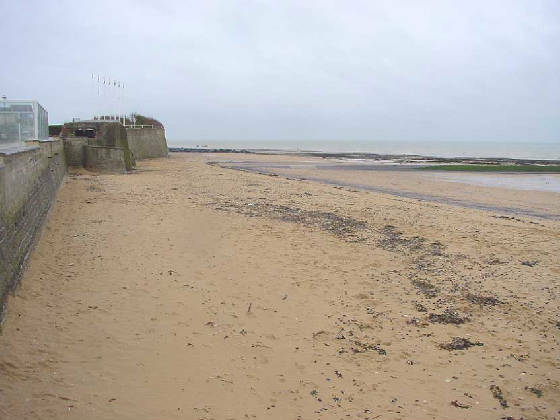 SWORD BEACH was the objective of 3rd (British) Infantry Division. They were to advance inland as far as Caen, and line up with British Airborne forces east of the Orne River/Caen Canal. The Orne River bridges had been seized in late at night on the 5th of June by a glider-borne reinforced company commanded by Maj. John Howard. As at the other beaches, British forces penetrated quite a ways inland after breaking the opposition at water's edge. Unfortunately, the objective of Caen was probably asking too much of a single infantry division, especially given the traffic jams and resistance encountered further inland. 1st Special Service (Commando) brigade commanded by Lord Lovat, linked up in the morning with Howard's force at Pegasus bridge on the British left. Fierce opposition from the 2lst Panzer and later the 12th SS Panzer division prevented the British from reaching Caen on the 6th. Indeed, Caen was not taken until late June.